Tulum Pueblo, a strip of buildings along a speedbump-heavy stretch of Mex. 307, is not much to look at. It is half-collapsed and dusty, all of its paint chipping. Rocks, hunks of cement, and leftover pieces of tin roof all crowd the tiny yards of tiny houses along with gnarled avocado trees, the occasional wandering goat or chicken, and little kids without clothes. Slogans and store names adorn the cinderblock walls. Bored teenagers wander the streets along with dirty-haired backpackers, skinny girls with yoga bags slung over their shoulders, boys with dreadlocks, and kids on bikes. The written directions tell us that our hostel is four streets after the bus station and instruct us to turn right a guard rail. We enter into a covered courtyard filled with towering green coconut trees, an abandoned tire or two, an herb garden, and a full kitchen where a bunch of artfully mussed teenagers mill about, cutting up fat slices of mango and cracking eggs as though they have lived here for a decade and not a night. They give the impression of having stumbled out of the ads for the current season of Survivor, or out of the Broadway cast of Hair. A tiny Mexican woman with a long braid offers her hand and welcomes us in Spanish. 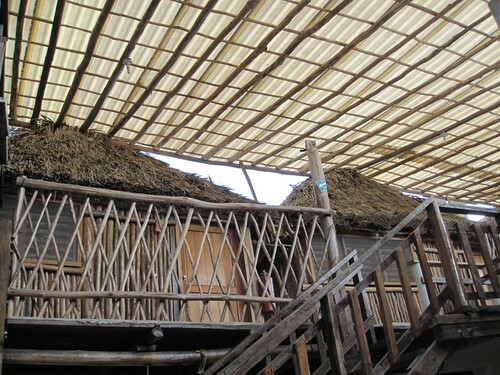 Clustered around the courtyard are the accommodations themselves: bamboo and grass shelters with hard concrete floors. In the center is a bunker-like dorm room. A tin roof covers the entire compound, which makes the whole business look like a model home show for the jungle-and-tropics set. The yacuzzi is hidden in a dark corner, its water murky and stagnant. A bare length of PVC pipe descends from the ceiling above it. We never find the Mayan steam room. Turns out that Eric doesn’t really want our passports. He just wants us to write our passport numbers in the sign-in book. He never actually says this. All he says is, “Can I have your passports?” like he maybe needs them for kindling. Our cabin (number 3) is dark inside save a single energy-saver lightbulb that, when illumiated, makes the room look like a jail cell or a Civil War sick ward. We try to keep it off as much as possible. Later, we will hear the universe go bump in the night—a mouse nibbling something in some corner, roosters crowing, flocks of tropical birds whooping at each other, all just above our heads, just beyond the first roof and the second, reminding us that in Tulum, the outside is always in, that the line between nature and us is imaginary—a thing to leave at home along with your winter socks. You won’t be needing it any time soon. Go there: The Casa del Sol is, as promised, four streets after the bus station (and right after the overpass) just off of Mex. 307 in Tulum Pueblo, Mexico. It is absolutely worth visiting. The bee stings me just as the man is getting to the part of his speech where he talks about how Italian is the best language for love. He pauses in the half-light for a moment, trying to decide what English is good for, his sentence trailing off. That’s when I get stung. Looking back, it is difficult to tell how the bee got there in the first place. I have not seen many since our arrival in Mexico. A few roaches, smaller than any I’ve ever found in my apartment in New York, yes. The occasional buzzing mosquito. But bees, no. My best guess is that he is perched, sinister and waiting, on the side of a bottle of hot sauce, hiding around the back, wily and out of sight. I touch the bottle neck and suddenly feel him wriggling, the faint buzz of wings, between my fingers. My first instinct, not being able to see him particularly well and thinking he is a harmless fly, is to squish him. And I do. Except that I also squish his stinger straight into the pad of my middle finger. I yelp in pain. The Italian guy keeps talking, asks if all women in New York City are as beautiful as the two of us. The perpetrator’s body falls limp to the sand under my feet, but his stinger stays, black and exactly perpendicular, in my finger. I yank it out and instantly wonder if that’s what you’re supposed to do in these situations. I remember jumbled information from first-aid classes of my youth: Maybe you’re supposed to leave it in there? Or maybe that’s something else, something having to do with a deep knife wound. Until this moment, or maybe until twenty minutes before when the the Italian arrived, we have a splendid time in the grass-roofed, seaside bar. 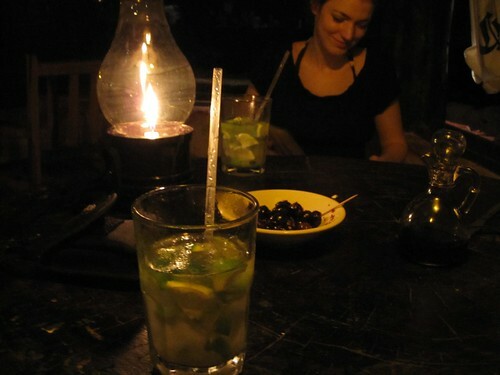 The raindrops pelt the sand out the window while we drink caipirinas by candle light. Our table is fashioned from dark drift wood. The waiter shakes our hands, brings us Mexican beer and a pizza. We dig our toes into the sand floor, feel all the weight tumble off our shoulders. Brea rushes up to the bar to get me a glass of ice, but the Italian beats her to it. He returns to the table with a fistful melting ice cubes, drops them on the plate in front of me. The Italian is thirty-five-ish and wearing a t-shirt with an illustration of a shark on the front, teeth bared, that says, “We Give You So Much to Eat” in English. His dark tan, the lines around his eyes, testify to his story: He’s Neapolitan, but has been living in Guatemala for the last six years. He spends a lot of time in Tulum. Doing what? He never says. My finger throbs and swells and I wonder, somewhat futily as the Italian continues his chatter, if I’m allergic to bee stings. This one is officially my first, and given our less-than-fortunate location on a remote beach in Mexico, this could very well be my last. A few minutes later, when I realize that I am still fully conscious and breathing properly, I decide that I am not. When the Italian realizes that I’m ignoring him in favor of my smarting right hand, he bends down for a look. In fact, he has been speaking in Italian the whole time, which is part of the reason why I humor him for so long. It is familiar and comfortable to me, and I just like to see, sometimes, how much I actually understand. As it turns out, I understand a lot—more than I would like, in this case. The Italian is madly in love with Brea, he tells me. He volunteers to buy us beer, tequila, wine. To be our personal tour guide in Tulum. To call us a cab if we need one. To come back to our hotel with us. We refuse all of the above as politely as possible. My finger still hurts, but I want to look at the moon. The rain has stopped. I excuse myself as humanely as possible and dart out the door, charge a ways down the sand. It is a perfect yellow-white circle hanging over the black sea. The constellation Orion appears in the sky just to the right, all of its stars gleaming and distinct in a way that I haven’t seen in ages—the belt, the dagger, the beautiful angle of his shoulders, poised, the arrow drawn back. Somehow, Brea and I escape. We pay our bill. We slip out to the shore and the Italian guy doesn’t follow. The wind blows at our faces as we watch the dark cabanas under the palm trees, imaging sleeping in hammocks—a little cold but worth it. Hours before, in daylight, we watched the rain storm gather along the shore. It’s gone now, washed out to sea, leaving nothing but clear sky. No small injury, no buzzing bee, could distract us. Go there: Tulum’s northern beaches are accessible from town by car or taxi. La Vita e Bella‘s beachfront bar serves Mexican and Italian food, among other things. The instant our feet touch the pillow-y white sand at Playa El Paraiso at Tulum, the clouds begin to gather in earnest. After a day of travel, of bus-switching and hotel-locating and mindless belly-filling, we are desperate just to get there, to see this thing that we’ve come to see. By the time we arrive, it’s nearly sunset. The sand is so soft that the feel of it under our sandals makes us uneasy, as though we’re doing it wrong, so we hastily remove them, left hands balanced against the dragon-scale side of a palm tree. We emerge from the line of trees to a beach that is Corona-ad perfect with its grass umbrellas and lounge chairs. It conjures visions of a million other somewheres, but not quite; it is boundless like a California beach but exploding with color, all hyper-saturated blues and blinding whites, like the Mediterranean. If the view didn’t stretch onward forever, if the complete circle of the sky weren’t visible in every direction, I would have guessed that it was a movie set awaiting the arrival of Leo DiCaprio in his swim trunks, of an eye-patched Johnny Depp. The wind blows at our backs, mangling our humidity-inflated hair even further, nudging us toward anchored little fishing boats and enormous pieces of bleached driftwood, toward more grass-roofed cabanas and the ever-darkening sky. To live in a city is to neglect the sky. Your eyes never wander beyond the tops of the buildings that brush up against it, and there’s not much of it to see, anyway. 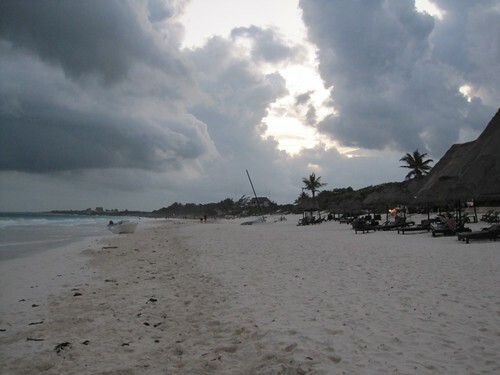 On the beach at Tulum, the clouds hang low and black, as tall as skyscrapers themselves. As we stroll, we pick out which beachside hotel bar will receive us when the rain starts and opt for one with a grass roof and candle light flickering from within. “Is it dark because the sun’s setting or because this storm is moving in?” I ask, watching the black stripe gather just above the water. Despite what we’re seeing, all the sand and water and skimpy clothes, it is still winter. It is still New Year’s Day. This is what winter looks like in this place. Back in New York City, I shivered on the jetway because it made no sense to get on the airplane with a wool coat only to emerge in Mexico with its useless bulk still in my hands. My seasonal clock is turned inside-out. Just as the unseen sun slides below the horizon, the first raindrops fall fat and warm on our shoulders. Our umbrellas stand ready, tucked into the back pockets of our beach bags, but between the wind and the warmth, it’s not worth opening them. We race toward our bar, toward its cave of light and its sheltering roof. There will be no sunning ourselves on this first day at the beach, no tanning or burning or lounging or forgetting all the gray and cold and work waiting at home. This is just a glimpse, Tulum in a dark mood so that we may appreciate her sunny days. Go there: Tulum is the southernmost point on the so-called “Mayan Riviera” south of Cancun, Mexico.